One of my all-time favorite pieces of typography is a poster that my sister Danielle made when she was four. Ever the entrepreneur, she had set up shop on a railroad tie along our road (Notch Road, of course) selling rocks painted with (probably washable) paint. On a regular piece of poster board, using a black marker, she carefully crafted a message to her customers letting them know the details of her start-up. Well, perhaps the message wasn’t quite that simple. And obviously the grammar and spelling weren’t great, but she was four, so I think we can overlook that. The true simplicity lies in the layout and typography. Though I’m not sure how she displayed her billboard (I was only one at the time), Danielle also seemed to understand the basic principles of how people would better absorb the messaging through layout design. The text block starts in the upper left of the page and draws the eye naturally down to the lower right. If a potential customer is trying to quickly scan something while driving (or biking or skateboarding or whatever anyone was doing on our road in the ’80s), this is much easier to read than a design that utilizes multiple columns or over-designed paragraphs of text or neon puffy paint…as was most likely the alternative popular choice of that time. 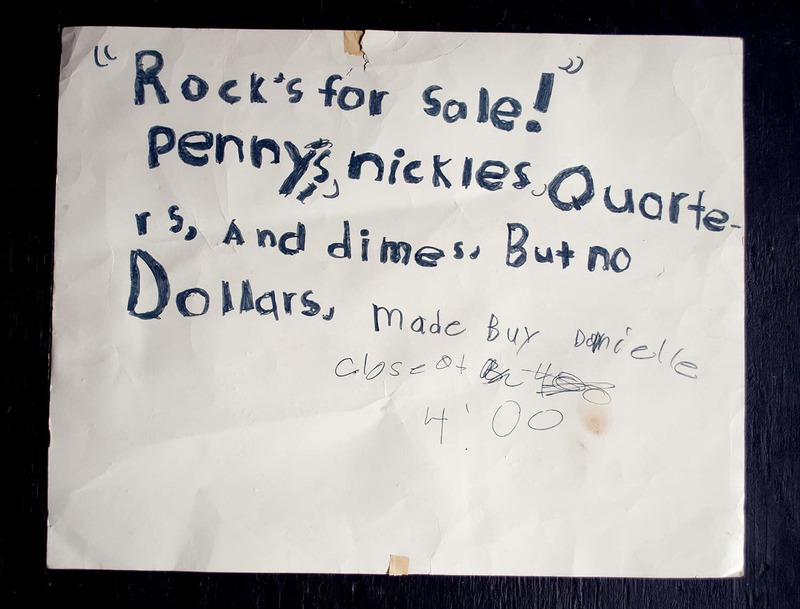 Our mom couldn’t remember how successful this rock stand actually was, but she did insist that Danielle not accept anymore dollars after she skipped home from her first day on the job with a fistful of cash, so I’m guessing she made quite a few sales. Even if she didn’t make it in the painted rock business, it is clear that her design sense and entrepreneurial spirit were in full swing pretty early on—as many of our innate artistic talents, if we can only listen carefully to the kid within to rediscover them.